When Pope Benedict XVI celebrated Mass with some 15,000 priests from 90 countries around the world on June 11 in St. Peter’s Square in Rome, thus bringing the Year for Priests to a close, two priests from the Archdiocese of Indianapolis worshipped with him. 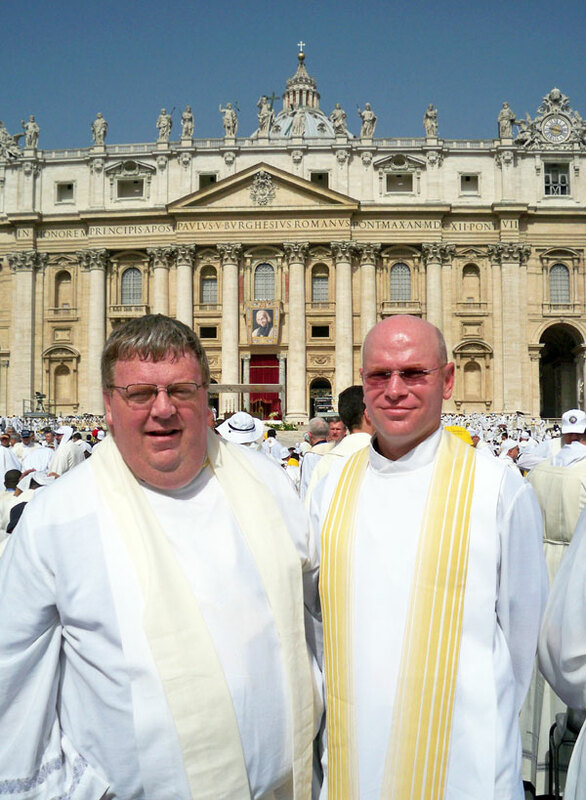 Father Robert Hausladen and Father Robert Robeson made the trip to Italy to represent the Church in central and southern Indiana at the Vatican-sponsored International Meeting of Priests and to renew their priestly life and ministry. Father Hausladen is the associate pastor of St. Pius X Parish and chaplain of Bishop Chatard High School, both in Indianapolis. Father Robeson is the rector of Bishop Simon Bruté College Seminary and provides sacramental assistance to St. Anthony and Holy Trinity parishes, all in Indianapolis. The Mass in St. Peter’s Square was the culminating event of a series of spiritual exercises. The two priests went to the Basilica of St. Paul Outside the Walls in Rome on June 9-10 to hear meditations on the priesthood given by Cardinals Joachim Meisner of Cologne and Marc Ouellet of Ottawa. Vatican Secretary of State Cardinal Tarcisio Bertone and Cardinal Claudio Hummes, prefect of the Vatican’s Prefect of the Congregation for the Clergy, were the principal celebrants of the Masses celebrated at the basilica. There were also periods for eucharistic adoration and confession during the priests’ time there. Father Robeson said that, although priests were in the confessionals at St. Paul, many of the priests ended up randomly hearing each other’s confessions. Father Hausladen appreciated what Cardinal Meisner had to say about the sacrament of reconciliation and the fact that over the past 60 years, a growing number of Catholics go to confession infrequently, thus often leaving priests alone in the confessional. “I’ve known [that] and felt a little sad,” Father Hausladen said. “But he put a twist on it. On the night of June 10, Father Hausladen and Father Robeson joined thousands of priests in St. Peter’s Square for a prayer vigil with Pope Benedict. The pontiff gave a reflection on the priesthood and answered questions about priestly life and ministry from priests from around the world. Unfortunately, the earpieces that English-speaking priests were to wear to receive a translation of what was said during the vigil and Mass in St. Peter’s Square did not work. Nonetheless, Father Robeson said the pope’s close bond with priests transcended the language barrier and communications glitch. Concelebrating the Mass in St. Peter’s Square, in which the pope led the priests in renewing their ordination promises, was a moving experience for Father Robeson. “As I was participating in the Mass, I had this intense gratitude for what God has done for me in calling me to the priesthood,” he said. “It was just an extraordinarily grateful feeling. Father Hausladen experienced priestly fraternity that crosses national borders in a special way in the square. During the Mass, the weather was sunny and hot. Many priests wore hats to keep themselves cool. Father Hausladen didn’t have one. “I was feeling horrible, personally,” he said. “I was about to pass out from heat exhaustion. I don’t think that I would have made it if it weren’t for another priest who just came up and gave me his hat. As the International Meeting of Priests came to an end, the two priests looked forward to returning to their ministry in central and southern Indiana. Just days after each priest returned to Indianapolis, they were both off ministering again. Father Hausladen traveled to the Grand Canyon in Arizona with 84 students participating in Roncalli High School’s annual Summer Field Studies program. Shortly before leaving on the trip, he talked about experiencing so close in time the massive man-made beauty in Rome and the massive natural beauty of the Grand Canyon. Also in a short time span, Father Robeson went from concelebrating Mass in St. Peter’s Square with thousands of other priests and the pope to celebrating Mass at Bishop Bruté Days with a few dozen teenage boys, seminarians and chaperones in a small wooden chapel at the Indiana Future Farmers of America Leadership Center in the woods of southern Johnson County.